As for me regarding my natural old self, I have always been the “nice girl”, the people pleaser who never wanted to offend anyone. How so? I behaved that way in order to be loved myself by everyone, something which, of course, never worked. Nonetheless, I tried and tried… and I failed and failed, that is, I was never loved by everyone whatever I had tried to change that. Tcha, what a misery! 😦 Thinking about our Lord once again, at times it seemed He was loved by the whole people since they got from Him what they had longed for and needed (forgiveness of sins, healing of their sicknesses, freedom from their demons etc. pp.). They rejoiced, “Hallelujah, what a wonderful God!” But alas, as He did not give them always what they wanted – namely He refused to become a Jewish king who ruled over them and freed them from the cruel Roman Empire – the same people who had seemingly loved Him, wanted to see Him dead on the cross. Why so? Because our Lord and God refused to serve their old selves; instead He wanted to free them from their old nature to which they could only die by believing in Him and receiving His Spirit later. Actually, Jesus was anything but a people pleaser. Here are only a few examples. It’s a real pain being a (recovering) people pleaser. Trying to find “just the right words” to share an uncomfortable truth with someone has the potential to negate the truth. Trying to deliver bad news while at the same time trying to manage the reaction of the person(s) I’m talking to, can leave the person doubly angry; anger over what I have to say, AND anger at my attempt to manipulate their reaction. The Lord put a friend in my life some years ago, who was bold enough to tell me after one such experience “I feel handled (managed)” for which I had to apologize. When I was a kid, I came home with scraped up knees several times and mom had to clean and bandage them. She’d set me on the bathroom counter, pry my hands off of my knee and scrub out the wound with a washcloth, hot water and soap. Then came the IODINE and I’d start squealing before the applicator ever touched my wound. Well of course it all hurt like the dickens and I’d direct my whimpering objections at mom while she did her work. And the “kiss” which she said would make it feel better, never really did. But I never doubted that she loved me, especially those few times that she cried with me while patching up my wounds. Susanne, thank you for the post. I appreciate getting to read it. Father, help us to die, in Jesus name, amen. You’re very welcome, dear Pat. Susanne, The gospel that Jesus lived and preached was not the words of a “nice guy.” He, like His Father, was not one who respected people’s persons. On one occasion He was kind to a widow and on another occasion He was very insulting to one. He commended Peter for hearing the voice of the Father and then called him down for listening to and speaking for the devil. 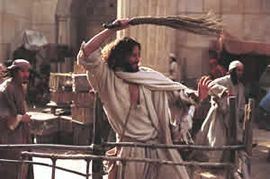 He was kind to a Roman tax collector and went home and ate with him and then he told those who collected the temple tax that they were a den of thieves and drove the point home with a whip as He drove them out. Flattery was something He was not capable of for He knew what lies in the hearts of men. “Who do you call good? None is good but my Father who is in heaven.” He had only one cure for mankind, death of that old self-seeking adamic nature and a baptism of the Holy Spirit and His cleansing fire. This is not the kind of sermon that gets big offerings and fills the pews in today’s mega-churches, is it? Yet, He has been showing Susanne and I that these are the very choices He is requiring of us! To please our families, friends and even well meaning Christians who are not yielded to the Spirit of God, instead of following His voice, will most often bring us under the power of the devil instead of making us one with our Father. God the Father also has one goal for those who would come to Him, that they would die to self and rise in newness of life in Christ and be conformed to the image of His Son. Anything less is just so much dead religion. Yes and amen to all you said, Michael. Excellent! ⭐ Thanks!! Yes, Michael, it has always been working in both directions. No pain, no gain. Or in other words, we will never be able to explore the depths of Christ’s love and mystery unless we have suffered with Him before. It is painful, but it is all worth it, I believe. I do not regret anything I had to go through. Okay, okay, I can say this NOW, after all. However, in the midst of another trial, it always looks much differently. I am really familiar with the “good girl, people pleasing” syndrome. God really yanked me out of my comfort zone and taught me that that is actually a sin. We either seek His favor or we seek people’s favor. We can’t serve two masters. To seek people’s approval keeps us in a state of fear, responding and reacting to them, rather then hearing and following His voice. Also, it makes us miserable, as you pointed out. Sometimes my powers of discernment were not very good either, so the loving and kind thing to do would have been to say “no,” but I wanted to make them happy. Indeed, the people pleaser syndrome is sin as soon as we refuse to listen to God’s leading and try to please other people instead. What a prison I found myself in and what a freedom to get more and more out of it! Thank you so much for your encouraging comment, TJ. I am glad you mentioned the difference between kind and nice. Indeed, I never thought about that before, but I immediately saw that you were right on with that. Thank you! The word “nice” is French nisce and comes from neo(no) scire(knowledge or science)..so nice technically means to be ignorant or to have no knowledge. I have a “teaching” on this breakdown difference that I think I posted a while back, I’ll try to locate that..
Oh boy those two comments by Jack and Gab are precious–thanks for the post. BEING KIND IS NOT NICE NOR BEING NICE! Ephesians 4:32- be ye kind one to another, tenderhearted, forgiving one another even as God for Christ’s sake hath forgiven you. Philippians 4:19 – My God shall supply all your need according to his riches in glory by Christ Jesus. Kind is not niceness. The word nice is the French word nisce. It comes from ne (no) and scire (knowledge or science). Nice means to be ignorant or to have no knowledge. To “act nice” means to act as though you have no knowledge of what’s going on. When a person knows truth, and they act nice, It IS a pretense. Nice IS not a Biblical attribute of Christians. Nice is what people become (when they “know’ truth) in order to gain favor, It is hypocrisy for men who ‘know’. To be ‘kind’ means to meet the ‘need’ of others. The words kind and need are in direct relationship to each other. The word kind and the word nice are direct opposites. The man who is kind tells all truth and sacrifices himself (Rom. 1? :1) in order to meet the need (necessity) of others, whether it be monetary, emotional, or spiritual. A man who IS unwilling to share his worldly goods or money with those who are in need does not possess the love of God (I John 3:17). Kind and need are not defined by 20th century definition. We confuse ‘kind and nice’ as well as ‘need and want”. When we are kind we are tenderhearted (full of sympathy). Sympathy (sumpathos) is to suffer (pathos) together (sum). Kindness is not always accepted by the needy. Some people ‘need’ rebuke for sin that they may repent. Others who are suffering and in anguish need someone to suffer with them (sympathy – compassion) and comfort them: Then others need our financial help. A man never needs our niceness, putting our approval on his sin. To be nice is usually to be untruthful in word and action. Nice is a diversionary tactic called ‘guile”, which means ‘to live by trickery”. Nice cares about self. Kind cares for others. Kind tells and does all truth. Nice covers it up (acting ignorant). Kind says and does truth, even when it is not wanted. When a mother tells her children to “act nice’ she usually means for them to pretend and be hypocritical (Don’t let these people ‘know’ what you are really like). We are kind to our children when we make them eat right, sleep right, etc. We meet their true needs, not their desires. When they suffer, we suffer with them. When they are hurt or injured we cease to be nice and we are only kind to them. Like our children, the world is not always ready and willing to accept ‘kindness’. Jesus said, ‘Woe unto you, when all men shall speak well of you (Luke 6:26).’ This is speaking of inoffensive ‘nice guys’ who straddle the fence and are unwilling to take a hard line stance for truth (they are always ‘beating around the bush . Jesus said that men will give an account for every idle word they speak (Matt. 12: 6). This word idle (argos) means inactive or ‘unemployed”. Idle words are unkind because they do not meet the need (becoming employed). Idle words are nice words. Jeremiah called these words lightness (easy or unimportant) and identified them with lies (Jer. 23:32). A kind man cares enough for others to deny himself, speaking truth, and supplying the need even at the cost of persecution and defamation of his character (Luke 6:22). If we are to be kind, we will tell all men all truth. There is nothing wrong with being nice (being ignorant). It is only when we ‘act nice’ (pretending that we don’t know) that we lie in wait to deceive (Eph. 4:14)’. This is a kind of “niceness” that is detestable in God’s sight, for sure! Pretending that we don’t know is a paraphrase for lying, isn’t it? TJ, by your definition I would say that you have a “nice” profile on your gravatar. It leaves us ignorant of who you are and your abbreviation “TJ” is no help, either. Neither Susanne or I leave any doubt to those who want to know who we are. Would you care to join us by doing the same instead of hiding your identity? I am a people pleaser. Now may GOD help me to stop doing that. Yes, Fred. Nobody but God can help us here. It is the experience of His love that is greater than any other we might have experienced in our life that finally sets us free from people pleasing. This is a reblog of an older article of mine from December 2015. Just yesterday, once again, I felt that the boundary I need to draw regarding commenters who come to my blog and write in a dishonest or phony, though seemingly often kind way, must be drawn much closer than before. What God revealed to me this morning was WHY Jesus was not a nice guy. The simple truth is this: Our Lord NEVER submitted to demons who spoke through human beings; He only submitted to His Father’s Holy Spirit. Therefore Jesus seemed to be even impolite and harsh at times. It was not so that Jesus did not love the people, but He loved His Father more. If you like to compare another earlier entry in which I exposed on my own experiences and on the WHY I began to draw these boundaries last year in November, you might check out https://enteringthepromisedland.wordpress.com/2015/11/11/do-not-allow-demons-to-speak/.